This set includes 27 pcs, A Thru Z plus the & symbol. These come with some oil on them to prevent rust. They are brand new and never used. These stamps are made out of hardened Steel. 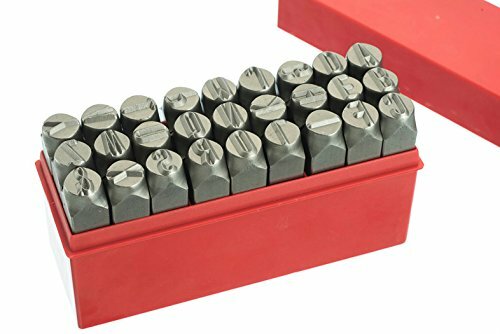 These are great for stamping Jewelry or your tools or silver or Gold bars you are making from either bullion or scrap. Letters are 12.5MM tall or apx 1/2" tall. Stamps are just under 2 3/4" Long. Case may vary in color & some of the letter cases are mis-marked 15/32" and they are really 1/2"
If you have any questions about this product by Make Your Own Gold Bars, contact us by completing and submitting the form below. If you are looking for a specif part number, please include it with your message.